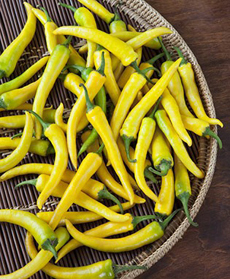 The golden cayenne chile is a sibling to the better-known red cayenne, which looks the same but is bright red in color. Photo courtesy BonniePlants.com. CAPSULE REPORT: Here’s all you need to know about chiles, a.k.a. chilis, chillis and chili peppers. Begin with the history of chiles, then dig in to our glossary of chile types and terms. This is Page 1 of an eight-page article. Click on the black links below to visit other pages. See our many other delicious and informative food glossaries. Chiles are part of the American diet, but they’re not exactly a new food fad. Millennia before someone coined the term “Tex Mex,” early Americans were flavoring their foods with hot chiles. They were one of the first cultivated crops, domesticated by prehistoric peoples from Peru to the Bahamas. This does not imply that each of the domesticated species arose in Bolivia. In fact, following transport by man and mutations, different chiles evolved or mutated in different place. While evidence supports a Mexican origin of domesticated Capsicum annuum, the other domesticated species arose in South America (see all six capsicum genuses). Traces of chiles have been found in bowls in Ecuador dating back 6,100 years. * Wild chiles have been a part of the diet in the Americas since about 7500 B.C.E.—all varieties, including the bell peppers, have a high vitamin C content. The word in Nahuatl, the language of the Aztecs, is “chilli,” the spelling that is used in the U.K. and its former colonies. Chiles were “discovered” in the Caribbean by Columbus, who appended the word “pepper” (pimiento, in Spanish) because of their fiery similarity to the black peppercorns he was familiar with—although there is no relationship between the two plants, or with Szechuan pepper. “Chile pepper” is a misnomer, and the term “pepper” is not used in Latin America. The first chiles were brought to Spain in 1493 by Diego Álvarez Chanca, a physician on Columbus’ second voyage to the West Indies. He first wrote about their medicinal effects in 1494. 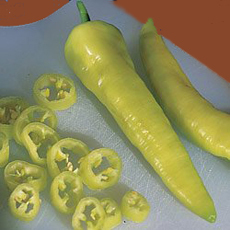 From Europe, chiles spread rapidly to India, China, and Japan. In Europe, they first were grown in the monastery gardens of Spain and Portugal as botanical curiosities, but the monks experimented with their culinary potential and discovered that their pungency offered an inexpensive substitute for black peppercorns, which were so costly that they were used as legal currency in some countries. What we call “heat” or ”fire” of the chile is known in the industry as the pungency† level. The pungency is the result of both the plant’s genetics and the environment in which it grows. Although plant breeders can produce a chile with a certain amount of relative heat by varying water amounts and temperature levels, genetic control is not yet fully understood. The heat is due to capsaicin, an alkaloid, and four related chemicals, collectively called capsaicinoids. Each capsaicinoid has a different effect on the mouth, and variation in the proportions of these chemical is responsible for the differing sensations produced by different varieties. Chiles are fruits. Different varieties have different levels of heat. The heat is from the chemical capsaicin, which is in the seeds and the white ribs inside the fruit. Capsaicin causes pain and inflammation if consumed to excess, and can even burn the skin on contact in high concentrations (habaneros, for example, are routinely picked with gloves). It is also the primary ingredient in pepper spray. †While many people think of pungent as a sharp or acrid smell, another meaning is “causing a sharp or irritating sensation,” e.g., burning.